What Does Code P0054 Mean? OBD II fault code P0054 is defined as “Heated Oxygen Sensor Resistance (Bank 1 Sensor 2)”, and is set when the PCM (Powertrain Control Module) detects an electrical resistance in the sensor control circuit that falls outside of predefined parameters. On engines with two cylinder heads, “Bank 1” refers to the bank of cylinders that contains cylinder #1, while “Sensor 2” refers to the oxygen sensor that is located downstream of the catalytic converter. Code P0054 indicates a problem with the electrical resistance of the control circuit, and while high or low resistance issues can occur in the control circuit wiring and even the PCM, it is more likely that the issue involves the internal resistance of the actual oxygen sensor itself, rather than the control circuit or the PCM. Typically, the resistance in this circuit will be 8 Ohms (or very close to it), and a variation of around 10% to either side of this value will set code P0054 and illuminate the CHECK ENGINE light. Oxygen sensors play a critical role in the calculation of fuel delivery, ignition-, and valve timing strategies by comparing the amount of oxygen in the exhaust stream (before it enters the catalytic converter) with the oxygen content of the ambient atmosphere. As the oxygen content of the exhaust stream changes continually during normal engine operation, the oxygen sensor uses the varying oxygen content of the exhaust gas to generate signal voltages that vary from about 100 millivolts to around 900 millivolts. The resulting signal voltages are used by the PCM to command changes in fuel trim, ignition timing, as well as valve timing on engines where VVT or VCS timing systems are fitted. A properly functioning oxygen sensor that is at its proper operating temperature (about 3500C) reacts to variations in the oxygen content of the exhaust gas almost immediately, thus ensuring that the PCM is always able to manage the engine efficiently, regardless of the engine load or speed. NOTE#1: While the resistance value of 8 Ohms stated here is valid for the majority of applications that use conventional oxygen sensors, the manual for the application being worked on should always be consulted for the exact values for that application. NOTE #2: Some Japanese vehicles, such as Toyota, use AIR/FUEL RATIO sensors that are NOT interchangeable with conventional oxygen sensors. Consult the relevant manual for the correct diagnostic, testing, and repair information for these applications. 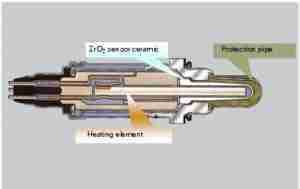 The image below shows the typical construction of a heated oxygen sensor. Note the location of the heater element, which requires a specific electrical resistance to warm up to several hundred degrees before the sensor will start to generate a signal voltage. What are the common causes of code P0054 ? Wiring and connectors that are damaged by impacts with road debris. Failed, or failing PCM. Note that although this is not altogether impossible, it is a rare event and the fault must be sought elsewhere before any controller is replaced. What are the symptoms of code P0054 ? Increased fuel consumption that can vary from slight, to dramatic. Hard starting may be present in some cases. Rough idling may be present in some cases. Reduced spark plug life due to carbon deposit buildup. How do you troubleshoot code P0054 ? NOTE #1: Bear in mind that the oxygen sensor itself forms part of the control circuit, which is why it must be tested along with the wiring when resistance tests are carried out. NOTE #2: Diagnosing code P0054 requires that the engine be in perfect running order, with no misfiring, rich-, or lean running conditions, or vacuum and exhaust leaks present that could influence the proper working of any oxygen sensor. If there are other codes present along with P0054, these codes must be resolved before starting a diagnostic procedure for code P0054. Record all stored fault codes, along with all available freeze frame data. This information could be very helpful if an intermittent fault is diagnosed later on. Perform a thorough visual inspection of all wiring associated with the affected sensor. Consult the manual to determine the function, color-coding, location, and routing of all wires in the circuit, and look for shorted, burnt, damaged, or broken wiring and connectors. Pay particular attention to the routing of the wiring, since unsecured and misrouted wiring can easily burn against hot exhaust components. Repair wiring and/or connectors as required, but be sure to route all wiring as far away from the exhaust system as possible. If no visible damage to the wiring is found, perform continuity, resistance, ground, and reference voltage checks on all associated wiring. Consult the manual on the exact values required for the application being worked on, but be sure to disconnect the sensor from the PCM before starting continuity checks to prevent damage to the controller. Since code P0054 indicates a resistance issue, pay particular attention to the resistance values. If the circuit is fused, check the resistance in both the reference voltage and signal voltage wires; replace the wiring if obtained values do not fall within the manufacturer’s specifications. If the circuit is not fused, the PCM is supplying the reference voltage (and sometimes the ground as well) so consult the manual on the relevant pin number and location in the PCM connector. Check for continuity and resistance from this pin to the corresponding pin in the connector on the end of the wiring harness. Compare obtained readings with those stated in the manual, and replace the affected wiring if obtained values differ from those stated in the manual. At this point it also a good idea to confirm that the oxygen sensor reference voltage is the same as the battery voltage, i.e., 12.6V to 13.8V to eliminate battery and charging system issues as the cause of long warm-up times of oxygen sensor heater elements. Low input voltages may not always cause code P0054, but it is easy to misinterpret long warm-up times as resistance issues. NOTE: Avoid repairing wiring, since poorly executed repairs could cause high resistance and continuity issues later on. The better option is always to replace wiring, as opposed to repairing it. If all electrical values fall within manufacturer’s specifications, or after repairs had been made, clear all codes and test the system again to see if the code returns. If it does return, it is almost certain that the sensor itself is defective. Remove the affected sensor from the exhaust system, and test its resistance. Note that the manual will state the exact resistance value, and the obtained reading must match this value exactly. Close enough is not good enough; oxygen sensors require a specific resistance to work properly, so replace the sensor if there is any doubt about its internal resistance. NOTE: Resist the temptation to replace the sensor with a cheap aftermarket part. These parts almost never conform to OEM specifications, meaning that not using OEM replacement sensors could cause a speedy recurrence of the problem. If the sensor is replaced, clear all codes still present, and test drive the vehicle with a suitable scanner connected to monitor the operation of the sensor in real time. Note that during normal operation, the signal voltage will never be static; after the PCM enters closed loop operation, it will change continually from around 100 millivolts to about 900 millivolts, depending on the engine load and speed. However, assuming that no misfiring, vacuum, or exhaust issues are present, this fluctuation is dependent on both the resistance of the control circuit and the sensor itself, meaning that a persisting, or intermittent resistance issue could affect the signal voltage. Both high and low resistances could cause the heater element not to work properly, which will ultimately affect the signal voltages generated. Note that intermittent problems can sometimes be extremely difficult to find and repair. In some cases, it may be necessary to allow the fault to worsen before an accurate diagnosis and definitive repair can be made. None found. Ask a question about P0054.